Imagine a world where no one ever sees a wild koala - that is something we can try to prevent! You can help by adopting a wild and free koala. 2019 ADOPTIONS are funding a full KOALA RESCUE KIT to be held at Koala Gardens for use here and for free loan in the local area. Flag pole, net on pole, transport cage, tree trap. Adoption of a wild koala is symbolic of course as they remain in the wild. There are levels of adoption depending on your own situation and what you would like in return for helping. Choose an adoption package that suits you. You can adopt for as little as $10 AUD! Electronic adoption certificate, story of your koala and a large size photo. A recurring monthly amount to help Koala Gardens continue to work actively for the koala. 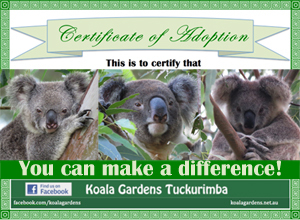 You will receive an Electronic adoption certificate, information AND a monthly ebulletin with all the happenings at Koala Gardens. This ebulletin is not available anywhere else. ALL koalas at Koala Gardens are wild animals and are not held captive on the property. They may choose to leave at any time as they develop their own home ranges. As they can leave the property, they may be at risk on surrounding roads and with animals on surrounding properties and this is beyond our control. Koala Gardens cannot guarantee your adopted koala will remain on the property for you to watch and follow. Koala Gardens can guarantee that every dollar helps protect koala habitat. The property contains habitat for FOURTEEN VULNERABLE native species. Professional bush regenerators carry out regeneration works regularly, in line with the property management plan, carried out with the safety of the koala residents in mind. Just to plant one tree costs $10.50, so every adoption dollar counts to creating and maintaining habitat. I think adoption is a very successful form of distance help for the koala. It is available to almost everyone, single or periodically. It is much more emotional and "sews long tail" because in many cases you are able to receive further news about the adopted koala and follow their life. I advise those parents who are raising children, pay attention to the monthly form of assistance by "adoption". If the economic situation allows, children can economize "pocket" money or try to make money and transfer for "their" koala: it brings responsibility, discipline, enterprise, teaches that when we love something, we take care of it. My family lives in Ukraine, but we all love the koalas. These amazing creatures have become our daily joy that we can see through the Internet. When I adopted Maxine, I felt that she became part of our family. I think about her, pray for her, looking forward to news of her life. The same applies to the hostess of Koala Gardens, where Maxine lives, Ms. Katrina - she became my girlfriend. It is so beautiful, in my life there is now a fluffy sun , and I met wonderful people who protect koalas, take care of nature, and this prompted me to become active to protect the environment myself. Thus, the adoption of koalas has made my life even more interesting and enjoyable. I wish that everyone is able to buy such a great pleasure! Olga. This is an opportunity to connect with one or more of your favourite koalas and help save them and their species.